The Cathedral and Churches of Echmiatsin and the Archaeological Site of Zvartnots are two prime examples of Armenian church design. Echmiatsin is the center of the Armenian Church. 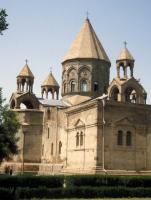 It locates the Echmiatsin Cathedral, which was built in 480 (making it the most ancient church in Armenia). Zvartnots dates from the 7th century, and was built to surpress the Echmiatsin Cathedral in grandeur. 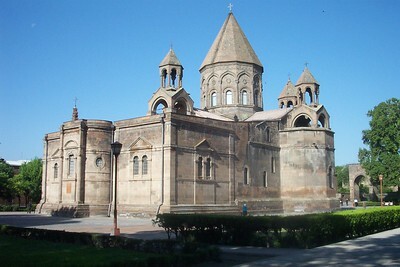 This complex consists of a temple and the palace of Catholicos Nerses III. Presumably, the architect if Zvartnots knew of Syrian and Byzantine structures. I visited this site (Echmiatsin, to be precise) twice during my stay in Armenia. The first time when fresh out of the plane, the second time after travelling around in Armenia for a week. At first I found the main cathedral a bit sober, but it's exuberant compared to others around the country. Zvartnots is a completely different sight. In ruins and with snow-clad mountains in the backgrounds, it looks like a classic Greek temple in the Peloponnesos. Later I saw a recnstruction of what it could have looked like before demolition, and that was definitely more like a typical Armenian cathedral. On my second visit, I also went to Surp Hripsime (shown in the big photo above): a 6th century church about 2 km. from the main Echmiatsin complex. It's a bit big and bulky, but nice. Very few unfortunately have heard about the "Golden Rule" of the ancient Armenian architecture which said "NO COPY, MAKE IT DIFFERENT". Echmiadzin and Zvarnots are a little underwhelming, especially compared to other monuments in Armenia. I would recommend Gerghard and Khor Virap as more interesting trips if you are staying in Yerevan. The museum in the main cathedral at Echmiadzin does have some interesting exhibits, but the main museums in Yerevan are better. Echmiatsin is the “Rome” or “Canterbury” of the Armenian Church being the home of the Katholikos of All Armenians and his cathedral. As such it is clearly an important site. The town is a relatively short drive from Yerevan and is an automatic excursion for anyone who visits the capital. 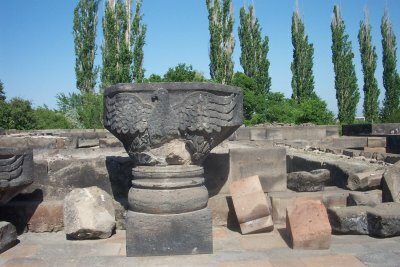 The archaeological remains of Armenia’s 7th century cathedral at Zvartnots are just outside the town and will be passed on the road to/from Yerevan. I personally didn’t find these 2 sites particularly memorable – certainly less so than the other 2 ecclesiastical WHS. The Zvartnots remains hinted at little in the way of the possible former glories of the site and the Cathedral has undergone a lot of later development and its siting close to the town centre among gardens lacks the drama and scenery of the other sites. 2.5: Stanislaw Warwas Tony H.
Tetraconch: Saint Hripsime Church at Echmiatsin: "has a square tetraconch highly complex central plan" (wiki); also Zvartnots "a 7th-century centrally planned aisled tetraconch type"
Early Christianity: The Cathedral was originally built in AD 301- 303 (and rebuilt in 480) by St Gregory the Illuminator who had been brought up as a Christian in Caeserea and later converted the Armenian king. His son, Aristakes of Armenia, attended the council of Nicaea. Introduction of Christianity: Armenia declared Christianity as its state religion in 301CE. According to the great 5th century Armenian historian Agatangeghos (Agafangel in Greek), St Gregor Lousavorich (St Gregory the Illuminator), first Patriarch of Armenia, had a vision. Christ came down from Heaven and touched the earth with a golden hammer. 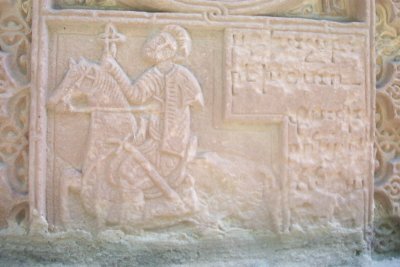 In that place, then called Vagharshpat and then the capital of Armenia, a church was built between 301-303 called Echmiatsin, ?the place where the Only Begotten descended". Undergoing Restoration or Repair: Etchmiadzin Cathedral: The latest renovation of the cathedral began in 2012, with a focus on strengthening and restoring the dome and the roof. In July 2014 it was still covered with scaffoldings. Memory of the World: A large part of the Matenadaran collection was preserved in Echmiatsin until the early 19th century: "This treasure has a centuries-long history, the nucleus of its manuscript fund is made up by the Echmiadzin Patriarchate Matenadaran. According to the 5th century historian Lazar Papetsi, the Echmiadzin Matenadaran existed as early as the 5th century." Incorrect UNESCO 'Number of locations': AB ev & map insist on 3 separate areas. UNESCO shows 6 different locations, of which the 6th (Cemetery of Congregation) is especially doubtful for a separate location.